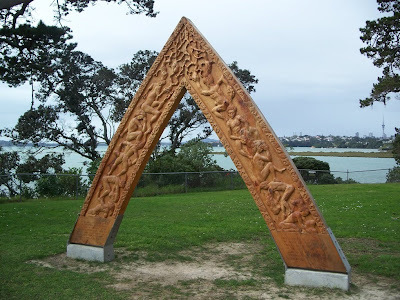 In late May this year, a very special arch was erected on Pt Chevalier's Coyle Park. It was formally unveiled on 20 June. 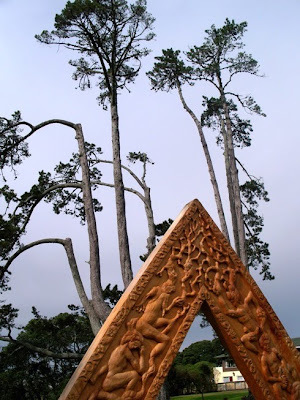 It tells the Maori legend of the formation of Meola Reef at the bottom of each piece of timber. 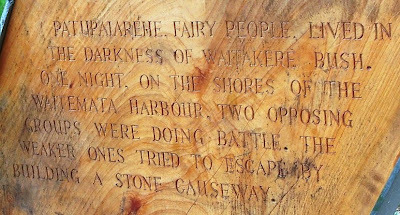 "Patupaiarehe, fairy people, lived in the darkness of Waitakere bush. 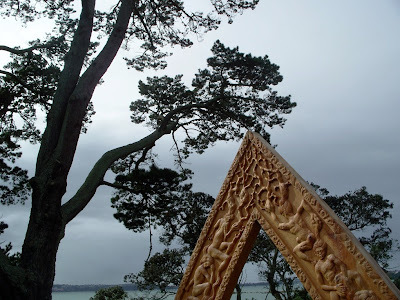 One night, on the shores of the Waitemata Harbour, two opposing groups were doing battle. The weaker ones tried to escape by building a stone causeway." "They laboured on unaware of the rising sun. 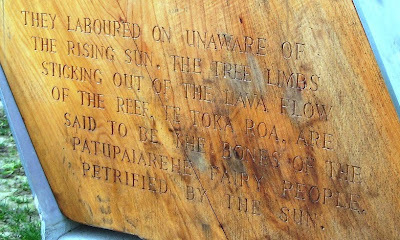 The tree limbs sticking out of the lava flow of the reef, Te Toka Roa, are said to be the bones of the Patupaiarehe fairy people, petrified by the sun." Pam told me that the installation was done in two parts. First they measured up the width of the base and the position of the metal braces relative to the wood. Then, they poured the concrete bases, and when that had set, brought back the sculpture. It slid in between the braces perfectly for bolting and securing. 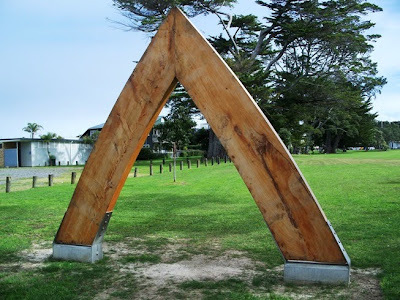 The timber is macrocarpa, from a line of trees planted by the Dignan family in about 1902 when they sold their land at the northern tip of the Point Chevalier peninsula for use as an infectious diseases hospital. The trees lined the southern boundary of the land they sold off. The hospital never got used enough to justify it's existence, and the land became a de facto public park. 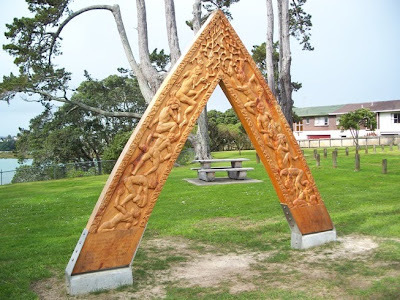 Eventually Auckland City Council managed to persuade the Health Board to surrender this land in exchange for a sliver of the Domain, and we got Coyle Park! Thanks for that, Kiwilima. As I've come to find out in studying Pt Chevalier's history -- little about it is simple. The sculpture doesn't appear to be on the original 1904 piece of Dignan estate land taken over by the Hospital Board for the infectious diseases hospital after all -- instead, it's on a sliver of the original farm transferred over to Council ownership later (exactly when, I'd need to look up sometime. It'll have to be for a future article for the Pt Chevalier History Group.) The pines were everywhere on the Dignan farm -- but macrocarpas are one of my favourite trees. Alive, they have such cool shapes and twists as they age. In death -- they've formed the basis for Tim's cool sculpture. Cheers.